Siby Varghese. 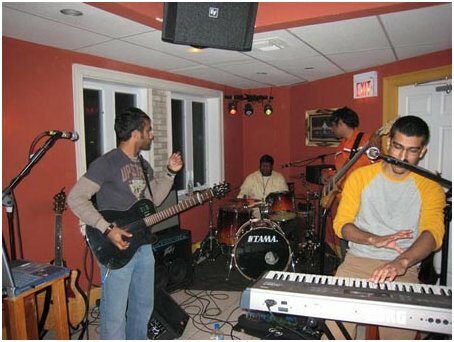 Hailing from Pennsylvania, Siby Varghese heads up The SV Band. I'll save the full story of how this band got started for the interview, but sufficing to say, they decided to step out from the crowd and minister through music. In addition, they've already been on tour. Enjoy this interview, and be sure to pick up their new CD, which is being released later this year (full details below)! Chung Lao: Siby, how’s it going? Siby: I grew in my hometown of Philly. I love it here and don’t ever want to leave. Unless of course if God calls me out of here…that will be a very difficult day for me, if it comes. 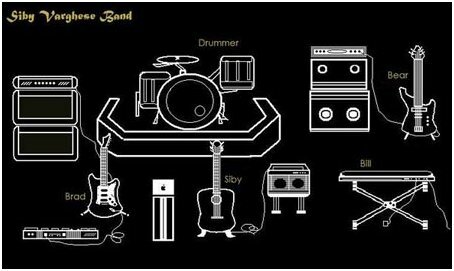 Chung Lao: Tell us about the “Siby Varghese Band”, and how you got started. A whole lot happened in between…but then in September of 2007, Billy, Bradley, and myself met at a Popeye’s Chicken for lunch after a Sunday morning church service to talk about ministry. After about 3 hours of pouring our hearts out to each other about our hearts for God, missions, ministry, and music…we officially formed as a ministry and band. 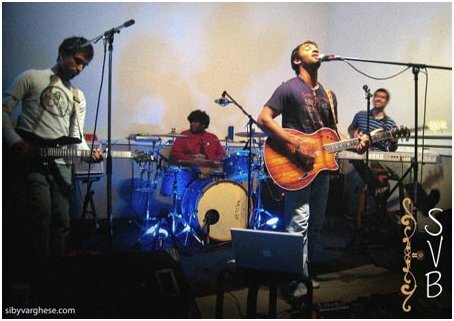 Over the next 3 months, the band grew to 5 members with the additions of Dany and Joby. And we also added 3 people to handle the technical and organizational aspects of the ministry: Bear, Liffy, and Staicy. Chung Lao: You mention John 3:30 as a guiding reference in the mission of your band. Tell us about that. Siby: John 3:30 has been a verse that has been speaking volumes to us over the past several months. The verse says, “He must became greater, and I must become less.” Billy spoke about this verse in a message he delivered at a local meeting in Philly, and from that point on, it began to stick with us. More than just a verse or a pretty saying, it began to evolve into a lifestyle and mindset for us personally and collectively as a ministry. To shift the focus of what we’re doing from us to where it belonged: Jesus Christ. And our prayer has been continually to let our faces be washed away by His glory. What we consider a successful evening of ministering is when people say “Wow that was an amazing encounter with Christ…” and not “Wow the band sounded great…” We want people to experience Christ, not music, when we minister. Chung Lao: You guys have been together for a while now. Now that you’ve been on tour, do you find you appreciate each other more, or have you gotten on each others last nerve yet? Siby: A little bit of both. Some good, some not so good, and some just weird. But I’ve grown to love all these guys more through it all and appreciate the heart and commitment each one of them have for the ministry. When we began the band back in September ’07, Bradley prayed a prayer during one of our prayer and writing sessions that pretty much asked God to let us grow from learning from each other on this journey that we are embarking on…and that’s exactly what has been happening. It’s been an amazing ride so far and I know it’s just going to get better. The awesome thing about it is that God has somehow brought this amazing unified spirit among us. That’s something we really value and try to maintain through open communication and honesty. Chung Lao: Who are some of your musical influences? Chung Lao: As “Indians”, there are certain stereotypes that our parents, the world, gives us in terms of what our occupation should be. What gave you guys the courage to step out there and create this band, and say, out with the stereotypes, and in with the decision to move forward with this band. Siby: Well, for me personally…back in 2005 when I decided to step into full-time ministry, it was a very difficult time in my life because at the time, my family was having a very difficult time accepting it. There were many nights where I wouldn’t sleep and just sit in silence before God asking Him to settle everything and speak to the hearts of my parents. Now, they are my biggest supporters and it’s amazing! During that time in my life, I had a decision to make that made me choose between the desire of my parents v. the call and purpose for which I was placed on this earth for. And weighing those out pretty much gave me my answer. I knew beyond a shadow of a doubt that it was in fact God’s will for me to pursue ministry, but I didn’t want to go forward without the approval of my parents, and thankfully, I didn’t have to. After months of prayer to God and many nights of debating and sometimes, heated arguments, God began to work in both my heart and the hearts of my parents. As a second generation Indian in America, I sort of understand where my parents are coming from and the purpose for which they came to America. It makes me love them more (if that’s possible) because I realize the sacrifice they had to make to give me a better life. My parents were living a very comfortable life in Dubai, but they moved out to Philly in hopes that my sister and I would be happy. And looking back at what they must have gone through when I decided to go into full-time ministry really makes me appreciate them. A lot of times we think they are trying to hold us down, when in reality they just want the best for us. But…if God has another purpose for us, we have to pray that God would reveal that to them as well. Chung Lao: On that note as well, it’s become rather cliché for people to say “Follow your Dream.” What advice would you give to young people out there, regardless of race, who are struggling with these decisions of what to do with their life? Siby: I totally believe in that saying and try my hardest to even live by it. However, I also believe that we should be very careful when following those dreams…especially when talking about ministry. If God has called you to do a work, then do it…but don’t jump into it like you’re just buying a pair of shoes. I’m only now beginning to realize what ministry is about, after 3 years…and I can say without hesitation that the past 3 years have been the most difficult of my life, and I’m pretty sure it’s not going to get much easier. A lot of times, people only see the ‘glamour’ of ministry and the positive aspects of it…but there is a lot behind it. All of that said, we have to realize that ministry does not only consist of preaching and leading worship, but can be done through secular jobs as well, and most importantly…through our lives and attitudes towards people. If we can’t minister through our lives without that of label of ‘Pastor’ or ‘Evangelist’, the label won’t help much. Follow your dreams, but make sure you pray and understand God’s will and timing before stepping into that dream. Chung Lao: What’s in your pocket right now? Siby: Chapstick and a wallet that has -$3 in it. How is that possible? I’m still trying to figure it out too. Chung Lao: Tell us about what happened with your leg, and how that has affected your life. When I woke up, my leg was still there…very bloody and wrapped up like a mummy, but it was still there. Apparently, the doctors found just enough blood flow in the leg to keep from amputating it…how good is God? So anyways…the doctors then told me that I would need many more surgeries and that the ability for me to walk is not definite. My leg at this point had a huge opening that was left that way for almost 2 ½ months. I was kept in the hospital for 2 weeks, went through 6 surgeries, had a machine attached to me that sucked out blood from the open area on my leg 24 hours a day for those 2 ½ months, and had nurses visit the house on a daily basis to dressing changes. It was get very difficult and my faith began to be tested. After a long night of prayer and pleading with God to somehow make my situation better, the Lord gave me peace about it all and reminded me to be silent and know that He was God. At that moment, I was completely and wholly satisfied in Christ. I told Him that day that I didn’t care if He healed me or did anything for me…as long as I had Him, I would be okay and I would be happy. The next day, me, Billy, and a few other friends were spending some time hanging out and playing table tennis. After losing terribly, I began to head back over to my crutches, which I laid on the ground while I played (hopping around on one foot). As I went over to the crutches, Billy’s fiancé looked at me and asked ‘what are you doing?’ I responded and said ‘what are you talking about? I’m going to get my crutches…’ She looked at me again and said, ‘You’re walking!’ I looked down, and I was in fact walking…out of nowhere, I was walking. I couldn’t believe it and neither could anyone in the room. The day before my mom asked me if I could put any kind of pressure on the leg, I tried, and I couldn’t because the pain was too unbearable, but here I was that night, walking…completely fine, without any pain. The one thing that I constantly tell people when sharing this testimony is that the greatest part about all of this is not the healing…but the fact that God saw that I was satisfied in who He was to me first, the night before…despite what He did for me. Then agfter that is when He healed me. That’s a revelation that God showed me that night and is continuing to reveal to me daily: to be satisfied in Christ….not because of what He does for us or what He could do for us…but just because He is Christ. A. Food(s): Indian food is my absolute favorite! rib eye steak, with a loaded baked potato and a Pepsi couldn’t hurt though…well I guess it could do some damage. C. Countries to Visit/Re-visit: Australia, North Africa, Mexico, France, pretty much the whole world! D. Hobbies: I love building stuff and doing construction! I actually converted the garage in my home into a studio/prayer/practice room for the band. Basketball and football are wonderful as well. I actually played basketball last week for the first time since the injury last year! Chung Lao: What job could you absolutely not do? Chung Lao: We live in a generation of very cynical young people, many of whom could care less about their walk with God. What advice do you have young people that feel this way? Siby: I would ask them to consider what the meaning of life is all about and what life after this consists of. That often strikes interesting conversation. Personally, I’ve always considered personal ministry through lifestyle to be the most effective form of ministry. When young people, or anyone for that matter, see people who have hearts of love and not just a drive to see conversions, they are drawn to that. Siby: Hmm…I would say pride. Siby: Yes I believe we are. I would go into this more but it’s about 2:30 in the morning and I need to sleep soon!! Siby: I believe the ideal church will only be seen in Heaven. However, just for hypotheticalness (I’m sure that’s not a word) sake, the ideal church to me would consist of people who are selfless, without pride, loving, and after one purpose…that is to glorify God in all they do. Of course evangelism and community outreach, etc…but a lot of times, I think the church forgets some of the basic stuff that is crucial and important. Chung Lao: Where can people find out the latest information on your tour dates & how to support your ministry in general? Siby: Our website is currently being redesigned and will be finished by May. 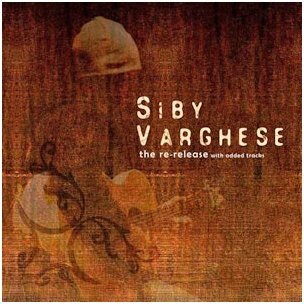 The website address is www.sibyvargheseband.com and it can still be accessed. On the website, there is also a link to our myspace page (myspace.com/sibyvarghese) where we are currently posting our tour dates and news. We are also trying to currently raise funds for the ministry. Donations can be made by going to the band website and using a credit/debit card securely through paypal. Chung Lao: You are working on a CD to be released this year. Tell our viewers about it, and what they can look forward to listening to! 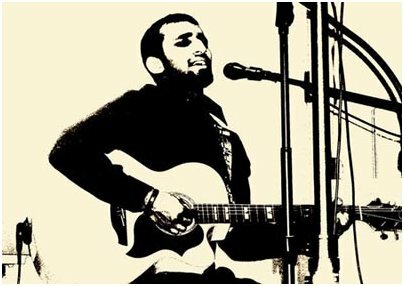 Siby: We are hoping to release the new CD by August 2008. The overarching theme of the album will be in relation to the verse in John 3:30. We’re trying some new things with this album, some new sounds, and new styles. We’re really excited about the album and are hoping it will be the beginning of something new for us as a band. Chung Lao: Appreciate your time Siby, lastly, leave us with a parting thought. Siby: Love God and love people. Simple and practical, but very difficult to practice. Chung Lao: Thanks Siby, we appreciate your time. Next up on The Tonight Show is Jonathan Singh of the 2007 BSC Champion Philly Ballazz. Keep in locked in right here for that one. Much Love.